The Atlantis Hotel is located at the very top of the well-known Palm. The whole hotel complex is huge and seems to be more an adventure park than a hotel. The Aquaventure Water Park should not be missed – although I had to skip it this time because of lack of time (what a shame). But I did visit the Atlantis Aquarium! You’ll find the entrance to this underwater world within the hotel/mall area. Entrance fee was 100 AED in summer 2015. Prepare yourself for an experience that will leave you wondering and dreaming! I’ve come to the conclusion that in a former life I must have been a mermaid to explain my passion for the ocean and its inhabitants. They have tried to recreate the fantasy city of Atlantis that many of us carry in our minds and that has been displayed a lot of times in movies. The water tanks are illuminated and the only source of light throughout the aquarium. 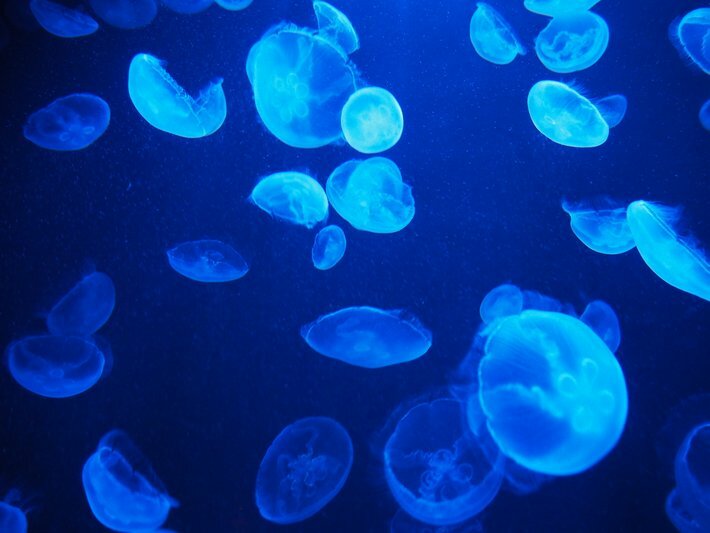 You’ll spot morays, lobsters, sea stars, jelly fish, nemos, and so much more in tanks. The highlight is the enormous tank with several windows with cushions in front of them to sit on and watch. Rays, sharks, big fish, small fish, yellow fish, blue fish, orange fish – you name it, you’ll find it there! There are malls and there are malls in Dubai! In between lies a gap that cannot be any bigger. 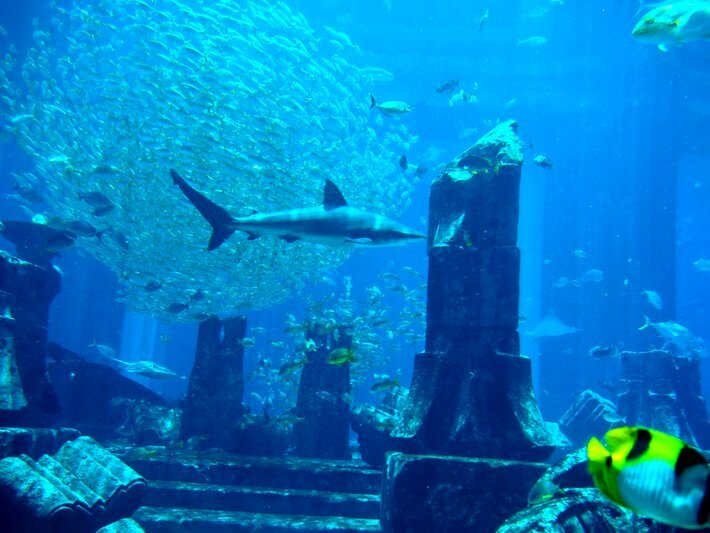 At Dubai Mall you’ll also find a huge aquarium that takes up more than just one floor! The biggest water tank can even be visited without buying a ticket! The most amazing thing about this specific mall is the ice skating rink! Within the mall the temperatures are freezing indeed because of the AC. But at the rink the temperatures seem even a bit lower. Rent a pair of skating boots and have fun on the ice! 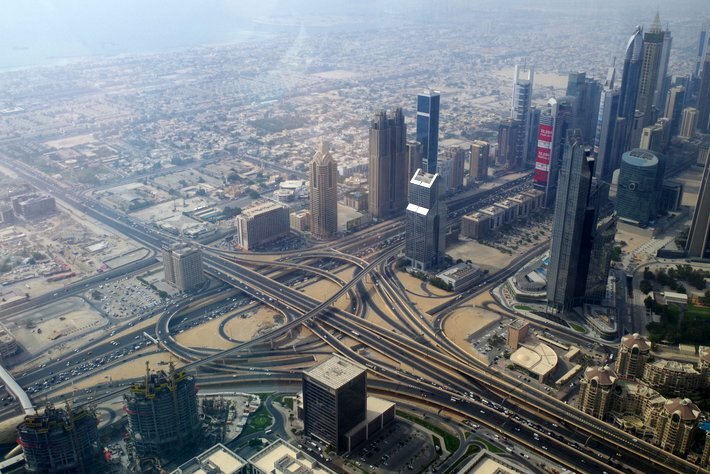 The highest standing building currently is found in Dubai. Where else would you expect it to be, right? The Burj Khalifa is impressive, not only talking about the architecture, but the whole set up is nicenicenice! To get up to the view point, you’ll have to get a ticket either online or at the desk at Dubai Mall (the two are connected). I advice you to book online. This saves you both money and time – my ticket was roughly 33€. You’ll have to select a day and a certain time when you want to go up. If there is no sandstorm you can see quite far, I was a bit unlucky but the view was still impressive. You can stay at the observation deck as long as you want to. 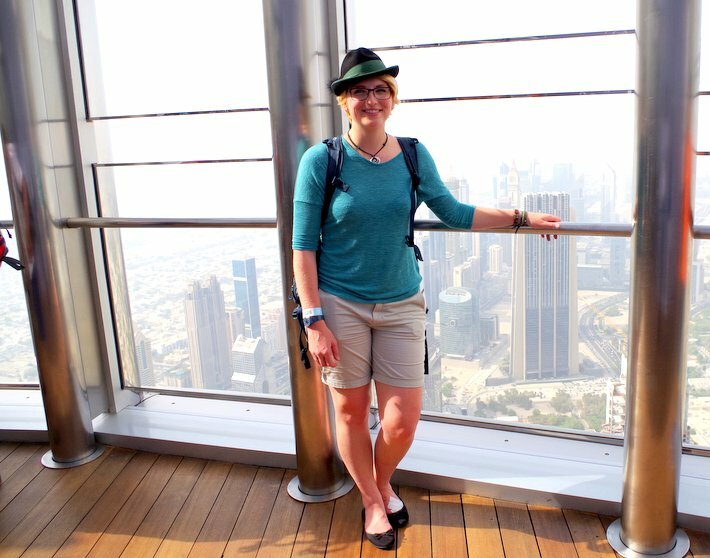 There are two options where you can get a great view: One gives you a 360° view over Dubai and you can still enjoy the comfy AC. The other is a terrace with – of course no AC. Although it is quite expensive to visit, make sure to also have some time left for the museum and overall set up! 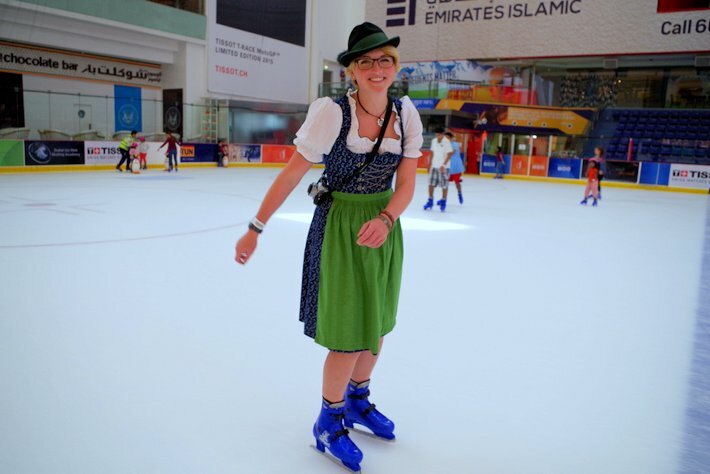 The Mall of the Emirates even tops the Dubai Mall – not it terms of shopping but in terms of fun and winter activities for sure! 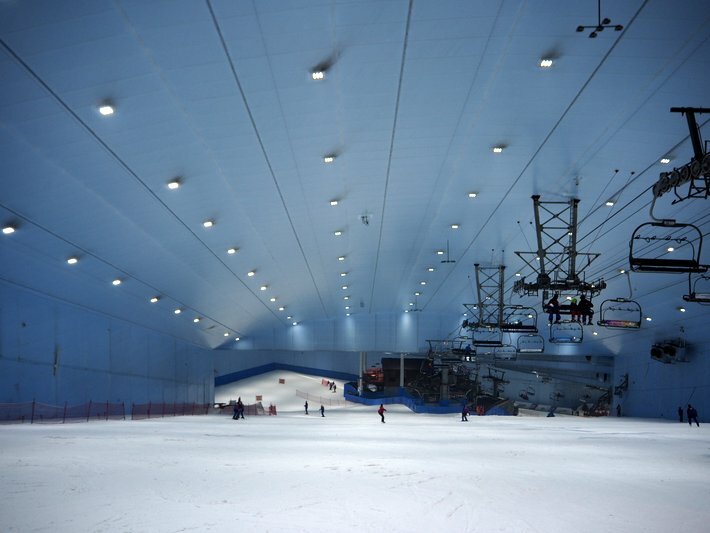 Can you imagine a huge inside skiing hall? I couldn’t really. For that reason I went there and took a look for myself and actually went skiing! The hall is massive with multiple lifts and even a chairlift! Crazy Dubai! Even if you are not a skier there are more great things to do here! 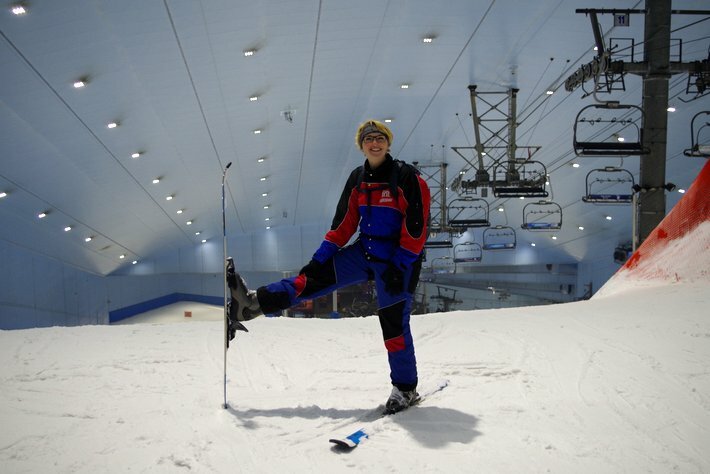 Zip line above the skiers, learn how to ski or to snowboard, go down an ice slope or enjoy the view with the chairlift. Skis, boots, trousers and jacket are included in the entrance fee, you simply need to bring or buy gloves, helmet/hood and a good mood! If you pay with Mastercard you’ll get 20% off the ticket price! 4×4 vehicle tour through the desert including activities such as sand boarding, riding a camel, getting a henna, BBQ and traditional dancing. Well this sounds great fun and it is if you got a solid stomach. I though I overcame my motion sickness about a year ago, but then I went on this 4×4 tour. Up and down, down and up, sideways, … that was simply too much and I was left white-faced. Thankfully I recovered quite fast, but still missed out on the camel farm that was also included in the trip. 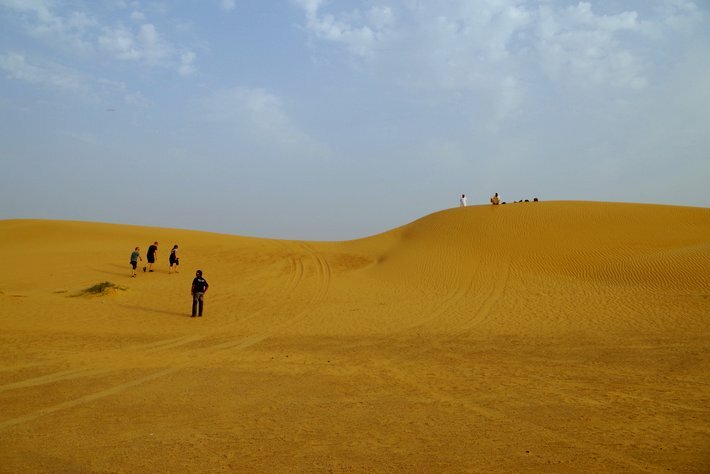 Sand boarding was the main reason I decided to go on this organised tour. I was quite disappointed because I was just allowed to go down twice on a very short strip. I managed not to fall and cover my sweaty body in the sand – but the level of fun was limited. The BBQ was served at a camp where more activities were offered – all for extra charge. Overall the food was nothing special, but the falafel and pita bread was quite good. A small henna was an extra 10 AED, but it turned out to be quite lovely. The traditional dancing was okay, but I’m not sure if it really was traditional. Ever wanted to feel like you’re famous? Like every single person in the world knows you? Well, then head off to the many Souks in Deira, the old part of Dubai, and be a VIP for a day! Walking along the narrow and packed streets gets you sole attention of many vendors, especially when you visit during the summer like I did, who try to guess where you’re from and then act like you are an old friend. “I see you are back! I am sure I saw you yesterday” – that’s what one guy said to me – erm no sorry it’s my first time visiting! Don’t be surprised if they want you to touch the scarfs they are wanting to sell or give you food to try. Decline but be friendly about it if you don’t want to buy the items on offer. They are just trying to make a living. What can you buy at the Souks? Well just about anything. Dubai is most famous for its Gold Souk and boy there are some impressing pieces of jewellery on display! Luckily I prefer silver jewellery or else my credit card would be in trouble! A lot of people also visit the Spice Souk to buy whatever is missing in their kitchen cupboards like spices, nuts, sweets, bread, etc. I bought some pistachios and absolutely loved them. They just tasted amazing and somewhat different to the pistachios in European food stores. One other thing you should definitely do is have some Indian food at the Souk. Many immigrants are from India and you will find simple food stalls everywhere. The food they offer is very authentic and also incredibly cheap! Everything in Dubai is modern, expensive, big, number one, first of its kind right? Wrong! 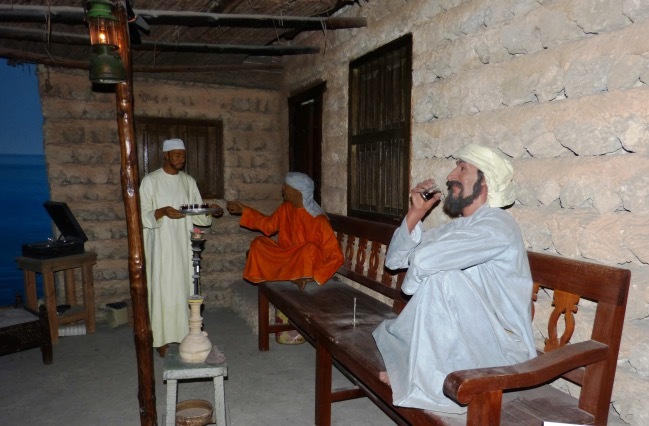 The Dubai Museum, located in the Al Fahidi Fort, is the main museum in Dubai and also the oldest building. Ever wondered what Dubai looked like before the financial boom started and all the skyscrapers appeared? Than make sure to pay a visit to the Dubai Museum. The museum is the busiest between August and April (high season) so don’t be surprised by the big crowds headed there. Over a million people visit the museum each year. You get to admire traditional Arabic houses, antique furniture, amazing wooden ships and really interesting artefacts. Art exhibits display old currency, pottery and musical instruments. 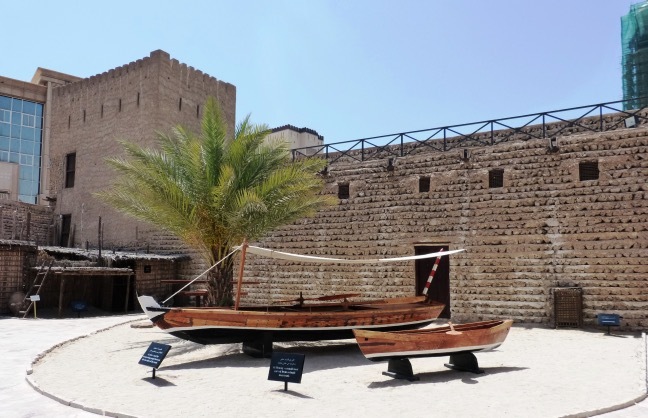 A dhow, a traditional wooden boat, is displayed in front of the Dubai Museum. What’s also really cool is that they have replicas of every day life situations which include life like mannequins. Have a look below! Some are so life like they actually made me jump because I thought there were actual people standing next to me! 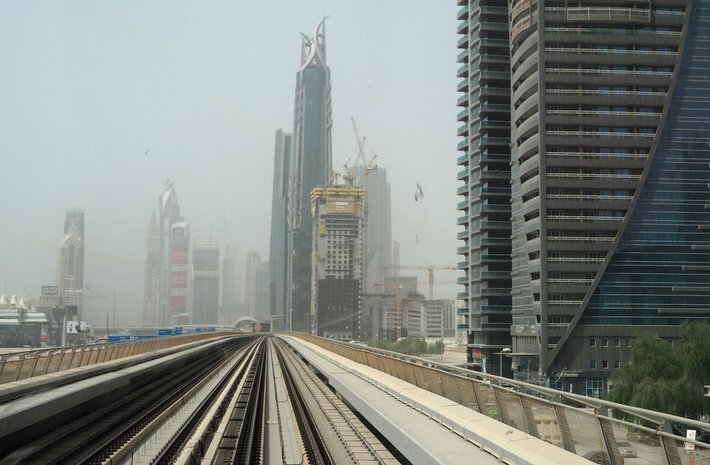 The metro in Dubai is great – you get anywhere quick and in style! There are also wagons for women and children only! But the greatest things about the metro are the first and last wagon! There are no train operators in the metro themselves. So you can enjoy the ride and the breathtaking view! What are your Dubai favourites? Let me know in the comments below! I’m not a ski girl, but sandboarding and desserts are totally my thing. Next time I have a long stop over I made make a trip into the city.